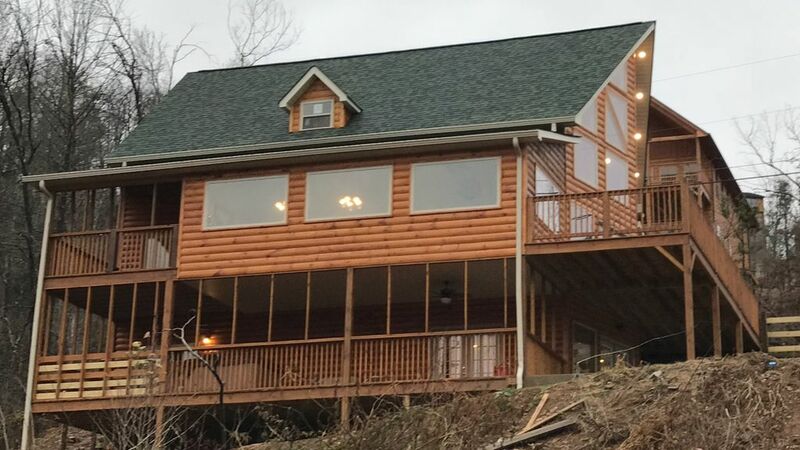 Our cabin is an awesome 5 bedroom/ 4.5 bath and is only 3 minutes to down town Gatlinburg. Enough amenities to keep entertained while at the cabin, such as relaxing in the Hot tub and enjoying the view. Our Rates start at $375/night depending on number of guest and time of year. Our cabin has lots of amenities. $375 rate is not during peak season. This cabin has Hot Tub, Gas Fire place, pool table, Foosball, Dry Sauna , and several gathering areas inside and outside cabin. Call us and we guarantee our rates to be very competitive. My name is Lilly, I love and enjoy my cabin and know you will too. Ask us how to save with possible available coupon codes. Gatlinburg TN, located adjacent to The Great Smoky Mountains National Park, is know as 'The Gateway to the Smokies'. This area attracts millions of visitors each year, who come to Gatlinburg for the beauty of the Smoky Mountains and the surrounding area. If you're planning your next vacation in Gatlinburg, plan ahead! most of the time you can save money, and get exactly what you're looking for before you arrive in Gatlinburg. There are plenty of activities to make your Gatlinburg vacation one to remember, such as hiking, rafting, horseback riding, shopping, music theaters, mini golf, several 18 hole golf courses, fine restaurants, craft stores, and much more. The busy season for Gatlinburg is April through October. During this time of the year Gatlinburg comes alive and people fill the sidewalks, and streets. Weekend travel is quite a challenge with more people coming than going, but they still seem to make their way to Gatlinburg and begin their Vacation. October in Gatlinburg is truly the highlight of the season. As the fall colors paint the Smoky Mountains it's truly Gatlinburg at it's best. Bring a lot of film there are just no words that can describe what you will see. Gatlinburg seems to calm down after October, but there are still things to do. November through March is the perfect time to run away to Gatlinburg for the weekend. This time of the year, Gatlinburg is less crowded and you can save a great deal on lodging as it gets later into the season. We bought this cabin because of the true cabin feel. We like having a sitting room along with a family room and a game room. Something for everyone. We chose this cabin because it is private but yet only 3 minutes to down town and we have all the nature surrounding us on our 1/2 acre lot. We made sure to put all the gaming machines in for the kids to enjoy and high speed internet for those who like to just sit and enjoy web searching. Plenty of acres to hike/walk. This cabin is only 8 minutes to Dollywood on the bypass which helps when traffic is tough. Grocery store only 2 mintues as well. So, come and enjoy our cabin with us and we hope you return for many years to come. Thank you! In late fall and winter months you can see the sky line view of the mountains, so very pretty. One great stay. Cabin is outstanding. Owners are terrific. Excellent communication. If you want a wonderful place to stay, this is it! Great location to Gatlinburg. Food store, breakfast restaurant, downtown shopping are all minutes away. It gets my 10 out of 10 rating. Brand new, clean, comfortable cabin. Mountain views, 5 minutes to grocery, 5 minutes to the strip. We had a great experience. This new place was just what we needed. Had room for all 10 kids and 4 adults. Had all amenities needed. Renters were accessible and kind. Even checked daily to see if we needed anything. Place was well decorated and designed. It was very convenient to downtown. Wish we could have stayed longer. Will definitely be returning to this great place. Myself and a few friends spent the weekend in this home so we could visit Gatlinburg. The most disappointing part of the trip is the fact that we did not spend more time in the home, because this is a spectacular home with great views and lots to do inside... to visit with friends or just with family is an experience we hope to have again. The place was absolutely beautiful! We were extremely excited to be one of the first few people to stay in this place. Everything was brand new and extremely clean. The master bathroom shower? Absolutely incredible. The adults got to sit and talk on the main level while the kids enjoyed their time in the game room. The only thing I regret is not being able to stay longer and not making time to enjoy the sauna! We will definitely be back. Your Group was only the 4th reservation to stay in the Newly Built Cabin. We were working so hard to get everything finished before the holidays. Thank you for taking such good care of our cabin, everything was tidy and left in perfect order with the check out instructions. Loved your idea of chair hammocks on the lower deck, we will be looking into getting some of those for the cabin as well. We would love to have you back again to try them out on your next visit when you can stay longer :-). Amazing! will definitely be back! The cabin was very spacious and great for our big group. Checking in and out was super easy, we got a key code and did not have to stop at any office to check in, even got there a little early and they let us go in because it was already cleaned, leaving was just as easy, locked the door and left. The view was great, I will definitely be back in the fall to see the colors changing thou! The hot tube was very relaxing and its on the lower level so there was only one cabin we could see so privacy was great and bedrooms/ beds were very nice, love the different themes. We went during a slow season and I'm not sure how it would have been during the busy season but the location is only a mile from town and there is an amazing breakfast place at the bottom of the road. The cabin is on a hill so the walk down was great, but didn't realize how much i was out of shape heading back up (would recommend driving). Only thing that we did not care for is the good amount of steps between the 4 levels in case you have elderly but to access the main level, its only three steps. We were blessed to have perfect weather. The dinning room table was my favorite because all 10 of us were able to eat together. The kids got to have a blast on the lower level playing pool, Foosball, and watching TV while we got to enjoy up stairs. Everything in the cabin is brand new and the kitchen had everything we needed for cooking and there was a decent amount of plates, silverware, etc. We were lucky enough to be the second customer's ever! - highly recommended from my family and I! MUST SPEAK WITH OWNER BEFORE BOOKING SO WE CAN APPLY DISCOUNTS AND COUPONS THAT ARE AVAILABLE..... Rates are subject to change until Reservation is Confirmed. Please go to our personal web page or call us for additional questions.